Have you ever wondered how sound effects are created? Some people imagine that you need sound processors and compressors taking up half your room. But it is not really so. In this article I want to show some curious stories from the world of sound effect design. First however, I should try to explain what a sound effect is. Firstly, it is an aural sensation; secondly, it is an acoustic wave. Sound effects are used to warn about dangers, navigation and communication. If you want to learn how to make sound effects, you have to experiment with aural sensations. Can you remember the needle and balloon practical joke? A great way of scaring someone. Simple and easy to make. A loud sound is created by releasing air under pressure emitting a low-frequency sound similar to an explosion. This explains why the victim is so frightened. Much safer than using an actual stick of dynamite for the same purpose. The first example of my experiments with sound effects is how I discovered (accidentally) how to recreate the sound of a jet engine. One day I was designing an NPC for a certain game project and I was hard pressed to come up with some new ideas. Then I just grabbed a blank sheet of paper, folded it in half and dragged it across the wall. It made a sound like a jet engine and a flying F-16. This experiment saved me having to go to an air show to record a real fighter jet sound. That is not the last thing you can do with a sheet of paper. You may be familiar with the Japanese art of origami. After watching a Prison Break episode where Michael Scofield uses the art of origami to send information I attempted to make a “prison break origami duck”. Obviously, it turned out to be much harder than it would seem, so I tried and tried again to make the goddam duck. Having just failed with another prototype duck, I crumpled it between thumbs and forefingers. A few moments later the sheet became useless, but I got a sound similar to that made when moving through tall grass. And now for something different. A riddle maybe? What sound does a slowly torn glued paper make? The sound that annoys you at night, but is close to you when you are hungry. A sound that comes from a fridge. Depending on how quickly you tear the paper, it makes the sound of freezing or unfreezing. For the next example we will use a lemon cut in half. Crushing it in your hand will produce the sounds of tearing flesh or a bullet or weapon digging into it. And another vegetable example. Have you ever wondered how sound designers generate the sounds of broken bones? Worry not, no arms or legs need to be broken in the creation of these sounds. A piece of leek will suffice. The sound changes depending on whether you brake the stem or twist the leaves. It can also be achieved with the use of a carrot. Sound Example 4.5 - sound of bones cracking, using a carrot. As a kid I used to play a game called “Alien vs predator” with my friends. If you played it, you may remember the sound of a flame-thrower. It is rather simple to recreate, though not as safe as squashing lemons. All you need is a spray deodorant and lighter… The sound may need to be repeated, as a real flame-thrower flames longer than our home-made variety. Making Sound Effects for Games - Sword clanks etc. When I was making sound effects for a browser based strategy game Spellarena I had to recreate some medieval sounds, such as a sword cut. I could not record the sounds at the Grunwald medieval fair (the yearly July 1410 Battle of Grunwald reconstruction), because I was working on the game in August and time travel is sadly unavailable. I pondered the problem of recreating these sounds in the studio for quite some time. The swish of a sword came from a two-meter feeder cable, while at the same time I was making attempts to record the sounds of two forks and a kitchen knife clashing together. When I finished recording I was actually quite astonished with the final effect. It was surprisingly lifelike. Now for some magic. Personally, I love to play a spellcasting character in fantasy games, so making sound effects for a mage in Spellarena was pure pleasure. The sound of a ring of fire can be created by quickly huffing into the microphone (adding some reverb will help make sound sounds more “fantasy”). Similarly, a firewall sound is created by slowly huffing into the microphone and editing sound in reverse. When making sound effects for the MMORPG Krai Mira, my task was to create the sounds of one of the opponents – a mutant from the ruins of a dead city, which carried a heap of junk on its body. 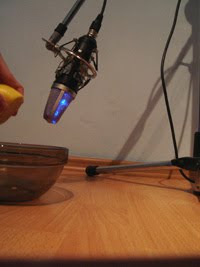 For making the sounds of its movement I used a lot of cutlery shaken in a container for drying dishes. The sound of a hitting cap was a combination of the sounds of a two-meter feeder cable and a small pot lightly hit with a hammer. In the Krai Mira universe we can encounter one more strange creature – a Helicer. This acid-spitting insect is quite a threat for a young traveler. To recreate the sound made by its four legs I combined the sound of scissors and a matchbox waved up and down. One of the most difficult sounds I had to record for the Krai Mira project was the sound of a metal trap shutting and opening. I needed to use a garlic press and a large cheese press. Having recorded both sounds I had to combine them in Audacity and set high frequency (14 to 16 khz). One of the sound effects I had to create for the Krai Mira was the sound of walking over swampy terrain. To recreate this sound you really do not need to take the recorder out on a rainy day, or make a homemade swamp in a potted plant. All you have to do is slowly squeeze a wet rag with your fist. Metal blinds are great for making the sounds for a game’s main or loading menu which shows moving metal elements. To record this sound you have to drag your finger quickly from the top to the bottom of the bind. 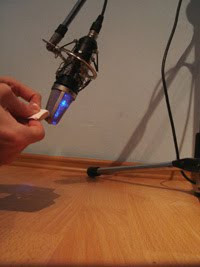 This method can also be used for making sound effects accompanying some robot animations, such as a dragonfly robot’s wings. 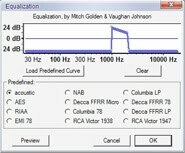 To bring your sound effects back to the 30s or make it sound like from an old radio, you have to adjust the Equalizer in Audacity to the middle band ( 1 khz – 3 khz ) and turn off the high and lower band (see image). And now for some physics. On winter days you may experience electric sparks jumping from your fingers to metal objects. To record the sound of this spark you have to rub two blankets together and then slowly move the blanket towards the microphone. You can use your own hair instead of one of the blankets, but be warned that after a few charges your haircut will look like Beethoven’s or Shopenhauer’s. After doing the recording it is advised to earth your electrostatic charge by touching a radiator, so as not to damage your sound equipment. A stronger spark sound can be recorded from a kitchen stove lighter. Star Wars?! Are you kidding? Some sound effects are actually quite easy to make, although most people just do not know how to make them. For example the sound of a door opening in Star Wars. You just plug one nostril and blow air from the other one. Simple, is it not? As long as you do not have a cold. A sound of a door streight from an SF movie can also be made by adjusting the height of a computer chair or with kitchen furniture (thanks to the kitchen cabinet door air spring). Being a sound designer is sometimes funny, because every day, even while doing shopping, I think of how various sounds can be recreated in the studio. If you have just started dabbling in sound effects or are looking for ideas to create a sound or sound background, let me give you a piece of advice. Before you start creating the sounds for any material, see it with no sounds and try to imagine the sound you would like to add to it. Write down all your ideas in a notebook, so you do not have to waste time trying to remember them. Finally, I will reveal how to make the sound of a parachute opening, by giving you another riddle. You may not like to carry it around, but it sure helps on a rainy day. Good luck !